Creating Floral Photos over black is always a lot of fun. The other day I got my hands on a pink miniature orchid. 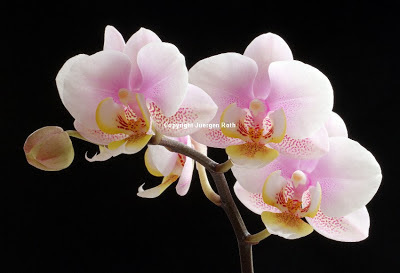 It was a great find and allowed me to add a few more images to my existing orchid Flower Fine Art Photography gallery. Our dining room window faces east and provides exceptional morning light bouncing off my neighbors' walls into our dining room. As a base for the flower I use a chair and books that I place in front of the window. Because I prefer working with natural light I use white cardboards to direct light towards the floral when it is facing away from the window. Adjusting the white boards to explore the impact on the lighting and better control the light on the flower is a great learning experience. It is a very delicate process and one has to watch carefully to notice the adjustment for maximum impact. Sometimes I am still caught by surprise on its affect and how it positively enhances the quality of a picture. In the final floral close up photograph of this pink orchid I positioned the flower in the best possible way that allowed the right amount of back-lighting leading to a more pleasing floral image. I chose a small aperture setting (large f-stop number) of f/32 that provided sufficient Depth of Field and an exposure time of 8 seconds. During post processing steps I removed dust spots, minimally adjusted lighting, contrast and color saturation before sharpening the final macro photography image of the pink orchid "Pink Sensations". Love Jigsaw Puzzles and flowers?